Whether you’re just starting high school or finishing up your doctoral thesis, academic life comes with undeniably unique experiences. As a student, not only do you have the opportunity to widen your intellectual knowledge, but you also get to socialize with new peers and maybe even travel the world! There’s a reason that your uncle keeps telling you that college was the best time of his life. However, it’s definitely not easy to manage the pressures and responsibilities that bring academic success. In this post, we’ll discuss some tips on how you can keep calm and meet any goal. Note: Check out ClickUp’s Template for Students! 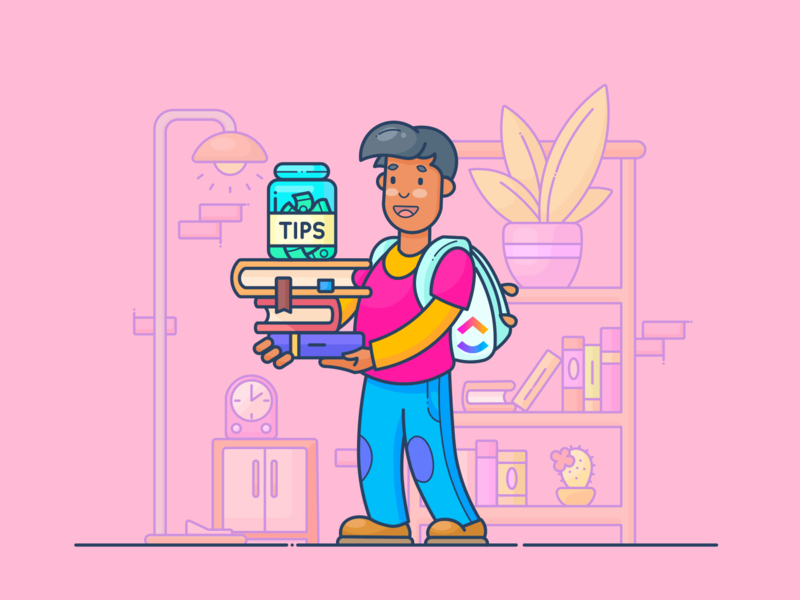 An array of endless homework assignments, lecture notes, and extracurricular activities can make it easy for things to slip through the cracks. While spiral notepads and Post-its might be effective for remembering things in the short term, if you really want to meet your goals, you need to create a foolproof system for success. With the ClickUp Hierarchy, it’s easy to do just that. You can even sort and/or filter your tasks to zoom in on what’s important! Once you’ve set up your structure, you’ll need to find ways to effectively collaborate on group work. It’s important to identify one central place where you can communicate with your peers, but also to find tools that help you delegate action items to different people. Luckily, you can keep this organization simple and cohesive with a ClickUp task. Within your tasks, you can chat with your teammates in the comment thread, and @-mention people so they’ll be notified of relevant updates. You can even assign a comment to another user to delegate mini action items. On the right-hand side, you can add rich details in your task description to let your teammates know what’s going on, and even embed videos and images for more detail. Have you decided exactly when you’re going to make that study guide for your Spanish Lit class? What about classifying your most important tasks for the day? The prospect of answering these questions can send you into an endless spiral of guilt-ridden procrastination. Luckily, ClickUp has some simple features that can help! Set up custom statuses to delineate the different phases of your workflow. 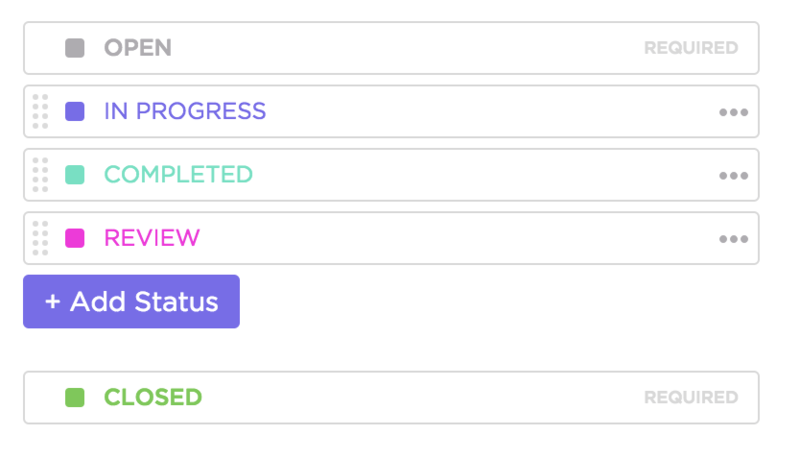 Simply move each task to the next status as you progress so you’ll always be able to monitor your progress. And don’t worry, we’ve already got some great statuses set up your you in the Student template! Include dates. Add start and due dates for your tasks by dragging and dropping them onto your ClickUp Calendar. You can do cool things like color the tasks by List or status, or even sync your tasks directly to your favorite external calendar. Set priorities. Priorities are also an enormously useful feature to help you confront your most urgent action items. Classify tasks as “urgent”, “high”, “normal” or “low” priority, and then sort them in List View to see them arranged top to bottom. You can even save your sorted view as a Favorite to come back to it at any time! We’ve all experienced that sensation of encroaching horror as exam season approaches. Not only do you have 37 finals to prep for, but you also told Joey that you would organize the Spring formal with him. And Melissa is counting on you to deliver that study guide for Biology. Oh, and your mom’s birthday is coming up. During those stressful times at school, just remember that not every task requires the same level of effort and preparation. And you don’t have to keep track of everything in your head. With the right system, you can break everything down into smaller, more manageable chunks. Two features for you: subtasks and checklists. Subtasks mirror the bodies of their parent tasks and therefore allow you to add lots of details. 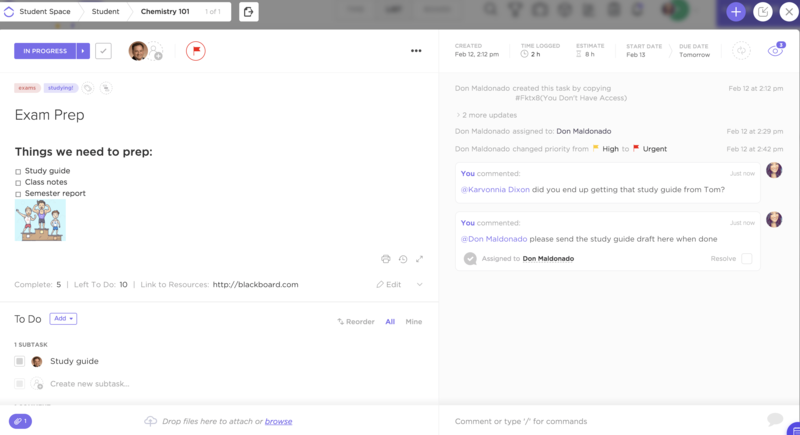 You can have separate statuses, conversation threads and even checklists within a subtask. On the other hand, checklists are all about line items being “done” or “not done”. These are for the super simple action items that you can just tick off as you go! Strong self-discipline isn’t the only key to be being a great student. In fact, academic success has as much to do with how you set up your environment to achieve your goals. By creating a dependable project management system that you actually want to use, you’ll save yourself the stress and earn back the time that you can spend enjoying your student life!